NEW YORK -- Want to give your child a leg up before he or she heads off to kindergarten? Parents can start by building a strong support system at home for their young learners. Dr. Richard E. Bavaria, Ph.D. and senior vice president for education outreach for Sylvan Learning, has created a list that that will help set your children up for success in kindergarten by instiling some fundamental skills and overall enthusiasm for learning. The list is divided up into two parts: characteristics of ready-to-learn kids and tips to build confidence in the classroom. 1. Letter recognition. Kids ready to learn can recite all or most of the alphabet. The alphabet song helps. Sing it often and slowly, so they'll get the letters. The "l, m, n, o, p" part is often confusing, and some kids string it all together as one silly letter. To make sure they get that they're five distinct letters, clap between each one. They'll get it. Plus it's fun. 2. Some word recognition. Kids ready to learn recognize by sight some common words. Teachers call these, sensibly enough, "sight words." Their names, say, or words they see often, like "stop," "my," "and," "the," "go," and "play." The Dolch Word List is teachers' most commonly used list. There's one for each grade. Here's the kindergarten list. Kids love to be able to recognize words, often pointing them out from the back seat. They feel capable and proud. And it makes us feel good, too, doesn't it? 3. Sound recognition. Kids ready to learn recognize that letters make sounds. This is the first step in learning phonics. They'll soon recognize rhyming words, words' initial sounds, and other cues. Dr. Seuss is great for this. Eventually they understand that letters make sounds, and sounds make words. Presto! Reading and comprehension are now possible. 4. Comfort with books. Kids ready to learn know how to hold and open a book, know we read from left to right, know that pictures and words go together. Yes, even in the age of e-readers. 5. Numbers. Kids ready to learn can count from one to ten. They know that we use numbers to count things. 6. Shapes. Kids ready to learn recognize basic shapes like rectangles, squares, triangles, and circles. This helps them to see patterns, to sort things, and to categorize. 7. Colors. Kids ready to learn recognize their colors. Colors, like shapes, help them to see patterns, to sort things, and to categorize. Colors get them receptive to art, as well. 8. Ability to listen. Kids ready to learn listen attentively. Well, most of the time, anyway. Listening is a fundamental skill in learning. In school, we listen to directions, we listen to stories, we listen to music, and we listen to our friends as they speak. 9. Ability to play with others. Kids ready to learn can play well with others. Of course, these little ones can still be pretty egocentric, but the ability to share, to interact comfortably, and to see that their friends have ideas and preferences is a basic need for school success. 10. Eagerness to learn. Kids ready to learn have a spark that kindles their brains. They want to learn, they want to grow, and they want to be able to do what they see their older siblings and school chums doing. Keeping that spark alive is a parent's holy responsibility. 11. Eagerness for independence. Kids ready to learn are eager to do things on their own. Putting on their coat, tying their shoes, washing their hands, eating neatly, getting out and, later, putting away their supplies. 12. Fine motor skills. Kids ready to learn are developing their fine motor skills. That's why kindergarten and primary teachers have kids do so much drawing, folding, pasting, coloring, and simple cutting. Outdoors on the playground, they bounce balls, skip rope, jump, hop, toss, and catch. As these fine motor skills sharpen, printing, then writing are possible. 13. Talking in complete sentences. Kids ready to learn can use simple sentences of about five to seven words. That's enough to answer typical questions, to ask for help, to maintain a simple conversation, or to share a thought. 1. Talk. 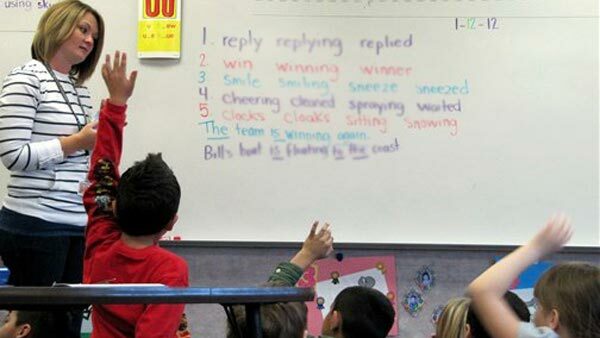 A well-developed oral vocabulary is a great predictor of a student's academic success. Makes sense. When she can express herself, ask questions, and make comments she's getting ready for important school skills like class participation and team-work. Give your children plenty of time to talk with you, to share the day and its events, and to learn about the give-and-take of conversation. 2. Listen. Knowing how to listen is basic in school. She'll listen to instructions from teachers, to other children's ideas, to songs and stories. Show her at home how to listen. Model for her. Make eye contact, respond with thoughtful comments, or tell her, "Mommy can't listen now, Amy, I have to concentrate on driving. I have some ideas, so let's talk about this in a few minutes when we get home." 3. Read. There's no better parent-child bonding activity. You can never start too early. Read favorite books together, sometime over and over. The warm familiarity makes reading pleasant and convivial. As he gets older, tell him about your favorite stories from when you were his age. This lets him see that reading is important to you, too. Casually move your finger along the words to show the connection between what you're saying and the print on the page. It won't hurt to ham it up as you're reading. 5. Count. Kids love to count things. And from counting will eventually come higher math skills like estimating, comparing and contrasting, and analyzing. Count fun things on your walks , as you drive, as you shop, as you play. 6. Solve problems. Ask for help as you solve household problems. "For the family reunion we'll have four houseguests. Please help me figure out where Grandma, Uncle Tim, Aunt Susan, and Kelly will sleep. Hector, so you have any ideas?" 8. Go to new places. Travel, whether it's a short trip or a voyage to another country, literally opens up the world. Check out your community, visit parks, museums, sites of historical interest, cherished places in your family's history, sports venues, or performance spaces. Use the internet to find inexpensive, interesting, and fun places nearby. Virtual tours are fun, too. Start with cool museums in faraway places -- most have virtual tours. 9. Expose to new experiences. New books, sports, music lessons, worship activities, arts and crafts, fun hobbies, time alone with you for talk and laughter -- kids discover new interests and talents whenever they're exposed to new experiences. 10. Build vocabulary. Think of words as tools for expression. The more words a child has at her disposal, the abler she'll be in communicating and learning. Try putting her new words on construction paper strips to form a word chain in her room. "Look at all these new words!" 11. Develop fine motor skills. Help your child develop his fine motor skills by involving him in simple tasks and games around the house. His kindergarten and primary grade teachers will expand them with cutting, pasting, coloring, and drawing. Toss a ball, make a mud pie, finger paint, plant some flower seeds, use mealtime cutlery. 12. Develop social skills. Show how to act with company. Please and thank you. Smile when speaking with others. Share. Take turns. This will help immensely in school. Have fun learning. I've always ascribed to the Learning-Should-Be-Fun-and-Exciting philosophy. Sing. Take walks. Count with jump rope and hop scotch. Use math with games and sports. Dance. Collect cool things. Make art. Put on a play.